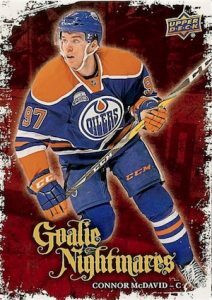 2016-17 Upper Deck Series 1 Hockey helps usher in the year for many NHL collectors with the flagship release from UD. While the set contains plenty of options, collectors understandably gravitate toward the Young Guns rookie cards that drop six per hobby box. 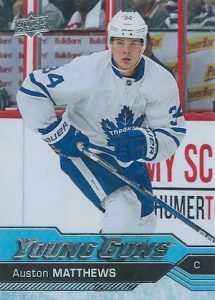 Adding to the 200-card base set that features updates for the new season, 50 Young Guns (1:4 packs) highlight the top rookie names heading into the year, with notable options like William Nylander as well as key 2016 NHL Draft picks such as Auston Matthews. 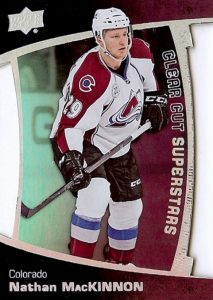 Clear Cut PETG parallels (1:72 packs) mirror the whole set, including Young Guns, and drop 1:3 boxes. These acetate cards are exclusive to physical hobby packs. Collectors can also find more standard parallels like Exclusives (#/100), High Gloss (#/10) and Printing Plates (1/1). UD Canvas inserts (Overall - 1:6 packs) give the main set more of a challenge and utilize some impressive images, averaging four per hobby box. 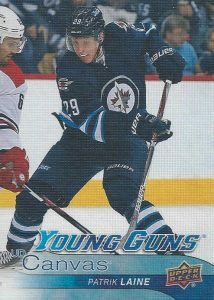 The UD Canvas Young Guns are a bit more rare at 1:2 boxes (1:48 packs). Beyond all this, 2016-17 Upper Deck Series 1 Hockey delivers a vast assortment of hits. This includes UD Game Jersey (1:36 packs) and Patch (#/15) on the relic side. Issued in several versions, A Piece of History features 300-Win Club (1:7,200 packs), 1,000-Point Club (1:2,400 packs), and 500-Goal Club (1:7,200) editions. 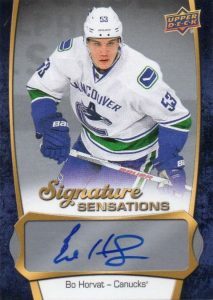 While not as common, signed inserts include 2016 NHL Draft SP Autographs (1:7,200 packs), Signature Sensations (1:288 packs) and UD Canvas Signatures (jersey #'d). Other 2016-17 Upper Deck Series 1 Hockey inserts include Shining Stars (Overall - 1:8 packs) inserts broken into Centers, Left Wingers and Goalies SP short prints. Royal Blue parallels drop one per hobby box. UD Portraits (Overall - 1:6 packs) focus on Superstars and Rookies with a base insert as well as limited Gold Foil (#/99 or less) and Platinum Blue (#/25 or less) parallels. More common pulls include Goalie Nightmares (1:8 packs) and Super Colossal (1:12 packs) while extreme rarity enters with Day with the Cup (1:2,000 packs) and 2016 NHL Draft SP (1:12,000 packs). 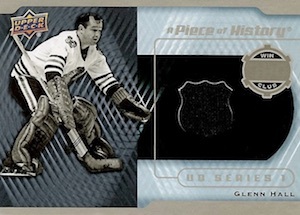 Clear Cut inserts fall in every case with options like Superstars, Honoured Members Update (#/100), Foundations (#/25), and Leaders (#/10). 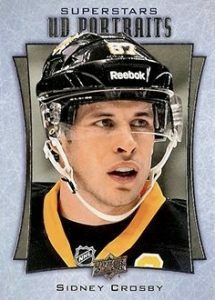 2016-17 Upper Deck Series 1 Hockey will also be found on UD ePack. 250 cards. Shop for complete sets on eBay. Young Guns Odds - 1:4 hobby/ePack/retail packs, 1:6 blaster. View a full guide and gallery for the Young Guns rookie cards. PARALLEL CARDS: Exclusives #/100 (h/e); Clear Cut 1:72 (Hobby only), High Gloss #/10 (h/e), Printing Plates 4/4 (h/e). 1 card. 1:12,000 hobby/ePack, 1:30,000 retail, 1:60,000 blaster. PARALLEL CARDS: Autograph - 1:72,000 (h/e). 120 cards. Shop for UD Canvas sets. Base Odds - 1:7 hobby/ePack/retail, 1:14 blaster. Young Guns Odds - 1:48 hobby/ePack/retail, 1:96 blaster. 2 cards. Overall odds - 1:7,200 hobby/ePack. 2 cards. Overall odds - 1:7,200 Hobby/ePacks. PARALLEL CARDS: Premium Material #/10. 30 cards. Serial numbered #/25. Hobby and ePacks. 7 cards.Serial numbered #/100. Hobby and ePacks. 5 cards. Serial numbered #/10. Hobby and ePacks. Overall Odds: 1:2,000 h/e; 1:5,000 r; 1:10,000 b. 30 cards. Hobby Exclusive. 1:8 packs. 10 cards. 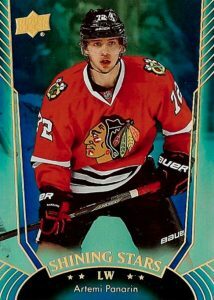 Three per Parkhurst Rookie Previews Blaster. PARALLEL CARDS: Blue - 1:37 b, Red 1:150 b. 50 cards. Overall odds noted below. BLUE PARALLEL CARDS: Defensemen - 1:72 b; Right Wingers - 1:72 tin, 1:36 f; Centers - 1:48 h/e/r; Left Wingers - 1:72 h/e/r; Goalies - 1:144 h/e/r. 35 cards. Overall odds: 1:288 Hobby/ePacks. 6 cards. 1 per Starter Kit Box. 20 cards. Hobby Exclusive. 1:12 packs. 16 cards. 2 per Team Triples Blaster. BLASTER PARALLEL CARDS: Black - 1:20 b. 44 cards. Overall odds: 1:36 h/e; 1:24 r, 1:240 b, 1:24 tin. 60 cards. Overall odds noted below. PARALLEL CARDS (Hobby/ePacks): Gold Foil #/25, Gold Rookies #/99; Blue Foil #/5, Blue Rookies #/25. 14 cards. 1 per UD Portraits Jumbo Blaster. 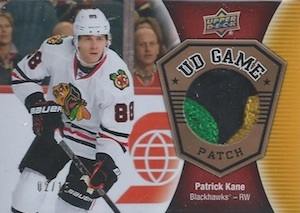 Is this UD Series 1 or OPC? I really hope that the design is subject to change because it looks cheap and full of extra garbage inserts. The things I have enjoyed about UD series 1 and 2 over the years is the excellent photography, the game jersey cards, and of course the young guns cards. Also getting YG canvas and other memorabilia cards was also a nice bonus. 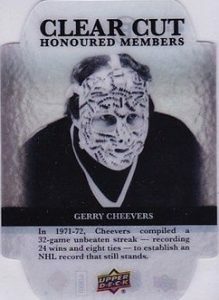 According to your info, now you might not even get one jersey card in a hobby box oh but you’ll get more worthless inserts like “goalie nightmares.” This product looks likes a nightmare! I will be hugely disappointed if the design and insert ratio is the same as above. Not actually rating the product, just commenting that the product seems to be taking a downward turn towards a more cheap-y kind of product. The new inserts seem very full-force-y (pretty widely agreed upon as the dumbest new product idea UD has ever had). The design seems very…plain….which isn’t always bad but in this case seems TOO plain. Maybe they’ll lower the price to OPC levels? In that case it might be just right. Ultimately as long as ePack exists I’ll never buy Series1/2 in hobby/wax form again as for the price of one box I can get all the insert sets I like, all the young guns for about $100 total from all the ePack price undercutters on COMC. This year I put all of series 2 together including all the portraits cards and young guns for about $125 CDN total and the Eichel YG accounted for $40 of that. A hobby shop owner told me that a series 1 hobby box will be likely selling for around $100 CDN! Sorry UD but Auston Matthews is not Connor McDavid and with the new design and inserts…well good luck getting many people to spend that coin. @Larry WOW they are either dreaming…or the consumers are just not being smart with their money at all. This shouldn’t be a dime over $80 CDN and that’s including tax. Scott…I think UD is hoping that this season’s interest in the hobby will carry over to next season. But I’m with you ~ I won’t be paying over $75 a box if I get it at all. Even 15-16 series 2 wasn’t worth the $ with all those OPC inserts. People were paying a premium to try to get the McDavid cards. Hey I’m all for offering a more affordable product esp. for kids and collectors on a budget. But then it must be reflectedin the price. Does it say how many memorabilia cards you get per box? Can’t wait to see the rookie checklist! Excited to see Mantha but I’m curious to see if any other Red Wings show up. Larry I believe the price is based on our awesome dollar. Right now it isn’t so good and I believe the price is the same that it has been for years or very close to it. The increase we have seen the last couple years is a reflection of our dollar. The good news is that if they release the E-Pack again it will control the price increase from the 2 greedy distributors and hobby shops. I called a hobby shop to check on the price of S2 2 months after release and it was the same as release. That’s different! Thank you E-Pack! I am with you and think it is too expensive but I’m sure the NHL is getting paid very well so UD can have exclusive rights. I just wish they would release OPC so it was actually affordable to collect as there is no current or future value and at 40 bucks a box 2 years later, I still think it’s too much. Collecting isn’t for kids anymore. All of it is geared towards the hit seeker aka gambler. More inserts isn’t a bad thing. It’s either that or too many packs with nothing but base cards. Looks like there will be an insert in almost every pack. I bought 13/14 then 15/16 and I felt like I was being ripped off because of so many packs with only base cards. It didn’t click what was missing at first but it was because 13/14 had the MVP insert. I didn’t buy in 14/15. The inserts are fun to collect. 13/14 had the MVP and Hockey Heroes inserts. I really liked those ones. I have multiple sets, don’t ask me why because I don’t know! Same price is fine if you get the same value but UD is reducing the number of ‘hits’ if you go by the info here. Sure they give more inserts but they aren’t numbered and aren’t rare and you get less memorabilia cards per hobby box too. Now I might not even get one game jersey card in a box but a bunch of worthless insert cards. No thanks! All UD is doing is forcing collectors to buy the cards they want on eBay and thus hurt hobby shops and the hobby in general. But as I said until people stand up and say enough UD will continue to profit from our stupidity. I’m going blind looking at that Portraits insert. I love ud hockey. But the price stinks. For rich people only now. Wonder if Matthews or Laine will be in Series 1. Heard there could be some issue with Matthews’ rights or something. By the way, can someone confirm which players get a YG card in series1? How many games do they need to play to get a card in series 1? Larry, they only need to play 1 game to get a card. The picture can be from pre season or rookie camp or rookie show case thing. Always bugs me when I can tell card isn’t from game action or regular season but three weeks isn’t a lot of time to prep a picture for the most massively mass production of all productions! HH..thanks for the info. Now we know Laine is in Series 2. I wonder if his Canvas YG is in S1. This year’s rookie class is pretty deep so it’ll be interesting when the checklist comes out. Also says that jersey cards are 1:36 and canvas YG are 1:48 so can I assume that you’d get at least one of them in a box? I’d be pretty upset to not get either of them. Complain that there are too many worthless jersey inserts per box. Complain that there now may not be a jersey insert in each box. These comment sections are a microcosm of exactly what is wrong with the hobby these days. Too many speculators these days (Thanks, Panini garbage!!!) and not enough collectors anymore. I think the designs, as presented as of 18-Oct-2016, look pretty good. I’d like to see pics of the other inserts, but all in good time, I suppose. It also looks like UD may have adopted a “#1 overall draft pick in Series 1, #2 overall draft pick in Series 2” pattern. That’s not bad at all, and gives collectors a reason to buy both, which is obviously what UD is attempting to accomplish. UD is Cannibalizing its own brand! e-pack has destroyed values of last years series 1 and 2 young guns. Series 2 was a disaster! e-pack was innovative, but innovation on the physical card side has been dormant for Upper Deck the past few years. 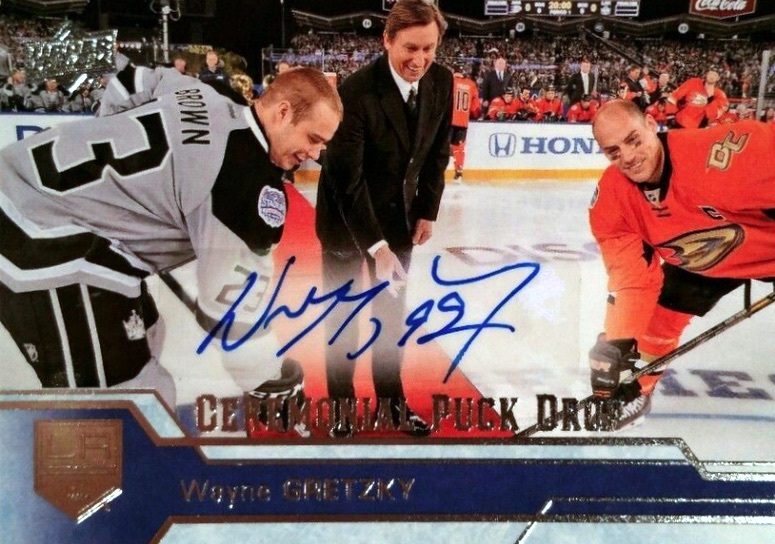 @Dave71120 – I love your comment about Panini, there are so many collectors that would love to see them back in hockey. They see all these cheap Panini products and don’t see what little value they get back. They are ruining the hobby in other sports, go look at Football and Basketball and see what seems like weekly releases of product that look similar to each other. As for Series 1, what are people expecting? It’s all about the Young Guns and always has been. GEEZ YOU GUYS !!! WHATS WITH ALL THE NEGATIVITY ABOUT UD1??? ITS THE BEST PRODUCT DOLLAR FOR DOLLAR OF THE YEAR!!! MAYBE SOME OF YOU GUYS SHOULD JUST GET OUT OF THE HOBBY!!! Eric, how has e-pack destroyed values of the Young Guns? I see the same thing as always; they start high and drop. I’m actually amazed that McDavids card is where it is. They make a crap load of this stuff, some e-pack isn’t going to matter. Where it does matter is controlling the distributor and hobby store prices in Canada. I own a hobby shop in MN. UD Ser.1 is always a big seller. My shelf price never exceeds 75-80 dollars. Those selling higher are speculating on the rookies. The public sometimes doesn’t care but that’s not what we are in business for. Checklist is out…still no Conor Sheary YG? Not sure I like the design this year ~ seems kind of dull. Having said that, it’s another great rookie class and I’m hoping I can get lucky and land the Laine YG canvas card. Happy hunting everyone! I agree with most of you, this product is terrible, no new traded players in their new uniforms, crappy checklist expect for the young guns. might pass on this product. Aden Taylor � Only hobby is out on November 10. Why change a winning combination, year after year, no matter what comes in between, Upper Deck series one and Upper Deck series two stand above everything else. I would like to include the very expensive product but this is not for me and am sure the same for most of the run of the mill collectors. Even if I can hardly afford to open a case, I will do it. My next intervention will be to let everyone know if I hit a really big one. My local shop did not have any Series 1 left this morning. Sold out and can not get any other from the distributor. I was lucky to get some at another store. The problem was I overpaid because of the high demand. Now, I have opened two boxes and found out that there are no UD Jersey cards so far, and have had some miscut cards. The set looks nice and I love the UD Canvas cards I did get a High Gloss and the Young Guns cards look great. Use to pay 900 dollars for a case now a lot more. It is such a great set, but I think I have learned I must start buying less and finish the set other ways at a cheaper price. I will let you know if I score in the rest of the case. I would like to know how some people buy cases of this stuff and make money. Please share stories. Thanks and remember it is a hobby. hi, all. just opened my first box of two. holy cow… very cool jack eichel 4x canvas, Patrick Laine & mitch marner young guns canvas checklist, portraits mcdavid, royal blue ss Sidney Crosby and the last 2 packs a Auston Matthews young gun rookie and Niklas lidstrom puck drop autographed card. very happy. thanks to the great upper deck company for a quality product again??? I love the photos in the UD Canvas set. Overall nice product and some new additions. Many inserts per box and the acetate cards are cool. I got my Day With the Cup card! **** – Great set, Young Guns look like previous sets – could use a better style – but nice anyways. Price is $100 / box now , up from $75 last year when they came out (a negative). The Super Colossal and Goalie Nightmares are Nightmares (negative). Shining Stars and Portrait – who cares much (even). The Clear Cut ***** (Positive 5) – a much needed improvement to the set. Not numbering the clear cuts are a negative. I estimate about 75 cards of each player based on there being 4 per box, compared to 3 Exclusives per box (known out of 100 each). Anybody agree/disagree with the math? Maybe I just have really bad luck but I’m not seeing these hits. I bought 2 hobby boxes and 3 of my cards ~ including my Puljujarvi YG ~ were damaged. Now I have to return them to UD at my own expense and maybe get them in 2-3 months. Oh and to rub salt in the wounds, half of my inserts in the second box were IDENTICAL to the ones in my first box. Nice job with the collation again UD but I’m not surprised. No YG canvas in 2 boxes oh but worthless new inserts like goalie nightmare and super colossal. It’s a colossal something! Look I love the base card photography and YG design and getting an acetate card was also nice. But it cost me over $100 for a box and I just don’t see the value. Maybe I’ll buy retail or just stop altogether. I’m hugely disappointed. Nick…what would you have said if you hadn’t pulled the Matthews card? or Canadian politics, at least for a couple of days thanks to to the huge Toronto Show and the Young Guns. And the baby boomers brag that they have cracked boxes/cases with fantastic result???? I’d give my shirt to attend a board meeting involving Upper Deck and Beckett. Talking about Beckett, I’d like to know if I’m getting blind, I now need two pair of glasses to read their monthly magazine. Still this is the hobby that keeps me rolling. Trey- do you know when the blasters come out? Parkhurst and oversized YGs? Phil � Retail is always tricky. I’ve seen blaster dates of 11/23 online but it can vary greatly by individual store. I collected cards during the boom of the 90s. Left the hobby due to life and started again last year due to McDavid interest. S1 last yr was good, s2 was weak. This yr s1 seems to be a lot deeper in terms of rookie crop talent that was chosen. Got 3 boxes on nov 10. Happy with purchase. Finished 2 base sets. Top 10 cards included nylander, 2x vessey, werenski, mantha and mantha acetate, 2x young gun checklist, an exclusive yg and 2 canvas ygs. Some other inserts and canvas added value. Colossal and nightmares are absolutely ridiculous, cheap and look like they belong on the back of a cereal box. $99 cdn is a lot for this product i feel. Bought 4 box artifacts 2016 for $90 cdn each. Got 9 rookie redemptions, including 1, 4, 5 picks, a rookie jersey patch auto and much more. This felt like a better purchase. I bought 2 hobby boxes and was overall disappointed with the hits – not because I didn’t hit on any of the big ones, but just because the basic hits are way too common and incredibly ugly for the most part. This product has really turned downhill to the low end of the spectrum on recent years, essentially only being carried by the Young Guns rookies. As far as hits go, I like the look of the canvas cards and have since they debuted, but now they’re way too common and easy to acquire without buying boxes or packs – and virtually worthless. 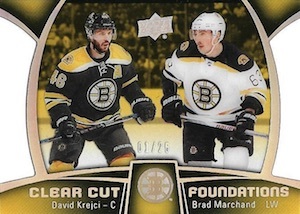 Ditto for the portraits (don’t like their look this year at all) and Shining Stars (don’t mind the look, don’t love it – but why do you need yet another basic insert for with the same guys as all of the other inserts?). Goalie Nightmares look awful and are just another pack filler with no real value and the same players as the other inserts. Super Collossal – really? 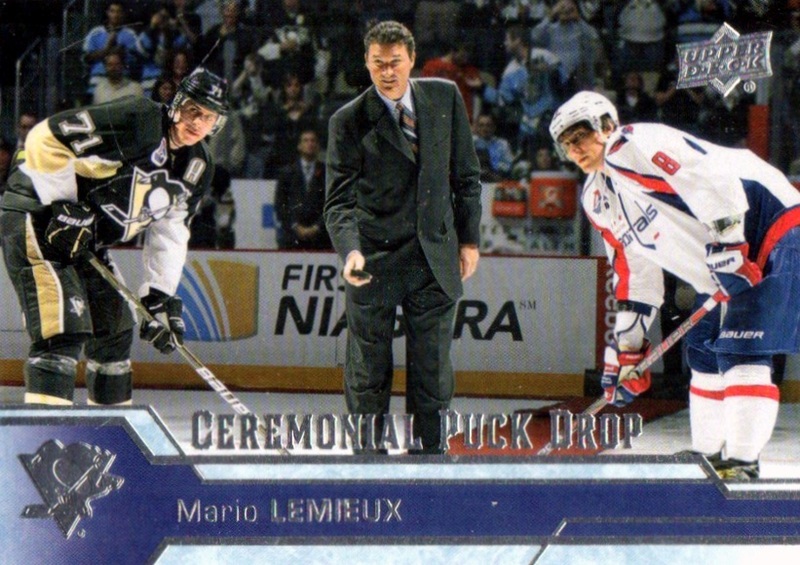 They also look awful and who wants to collect the PIM leaders of the league as a hit? Very poor idea and a terrible name for the subset in general. The hits you want (jerseys, autos, exclusives, acetates etc) are incredibly hard to hit and you’re just better off buying the individual cards from retailers or E-bay after the fact unless you really love that feeling of opening packs and hoping like hell to get that 1 big score, of which there are nowhere near enough to come close to the price you pay for this product. If collecting base sets of cards and insert subsets with no real value is your thing, then this product is perfect for you, albeit overpriced for that purpose. The OPC brand of UD gives you practically that same thing at a lower price – ditto UD MVP. Basically, Series 1 and 2 are a half-step up from those – only because of the Young Guns. If hitting memorabilia, signatures and cards that will retain value are your thing – there’s no point in buying this product at all. Just wait 3 months until the Matthews YG can be had for half (or less) of what it’s selling for now and skip this product entirely. Because of the Young Guns, series one and two deserve to be considered a must for the rookie collectors. Just cracked a case of series one and the coming weeks will tell if it was worth the $$$$ spent. One thing for sure, it’s a shame to have to go to Walmart in order to complete the Shining Stars. By the way the only good thing about these cards, they are shiny, period. Save your $$ and buy retail. Hobby boxes are not worth it and you have as much of or a better chance of hitting a canvas YG or game jersey card. And best of all, there are no super colossal or goalie nightmares insert garbage cards. Sounds good to me. Nice product. I like the additions of the clearcut cards. The other inserts are a dime a dozen. I would rate this a 4/5 or 5/5 if the quality of the cards was better. Just received the grading information for my submission of 70 cards and it’s terrible. Trey you seem in the loop. Any info? Nice checklist of Young Guns, like the Portraits and Acetate inserts. I only give 3 stars because of the large amount of cards whose photographs are out of focus. I just can’t see how anyone would give this 5 stars with these blaring problems. Last year didn’t have a single out-of-focus photo and this year, in series 1 alone, there are 16. And this doesn’t even include the Portraits. The Portraits, head shots, should be nice pictures, right? No. Take a look; you’ll see the difference between the good ones and the majority of the rest, which are bad. I will not be purchasing next year. Bought 3 boxes and no YG Canvas. My best YG card was Puljujarvi and the corner was damaged. Several insert cards were identical in 2 different boxes. Goalie nightmares and colosssl cards just add insult to injury. I’m really starting to detest UD and hope the NHL gives other companies a chance to produce official product soon. The monster that is UD has to be stopped. Enough is enough. I just opened 2 boxes. I’d like to give 2.5 stars but 2 is too low. The Super Colossal & Goalie Nightmares are silly & worthless & the Portraits just look cheap. I had 1 jersey (Domi) & 1 Clearcut Superstar (Perry). The surprise is that of my 6 Young Guns in each box, I had 4 duplicates! They are: Maglin, Santini, Fasching & Buchnevich. Come on, UD, there are 50 YGs that are supposed to be inserted at random. I am 1 card short of a base set but why some top players are omitted out of 200 cards, I have no idea. No Malkin, Sequin, Toews, Kopitar,Stamkos and others & they only have 1 Sedin…those guys are inseparable! Disappointing. Ernst Wagner….. Definitely a lie, but nice try. Where are my felllow canadians buying there hobby boxes for under $100…. my local store is charging almost $180!!! Can’t believe how many posts of Puljujarvi having corners damaged I’m reading! What the heck is going on. I had two damaged bought one from my neigbor, you guessed it…damaged! I honestly think your better off buying the few cards that might be worth salvaging, Matthews, Vessey, Tkachuk and a few others. I think spending 4-500 on hopes and god pleases are nothing but a waste of time. I live outside ST.Catherines and got my box for 85. Reading all this 100-120 is ridiculous guys!! Prediction….going to be similiar to the old OPC Premier, hope not but think so!! This is an average product and not over expensive. Those that are complaining obviously know nothing about the hobby or how a business operates. People chase the young guns and Matthews is a great reason why it is worth it this year. No its not a McDavid but still worth the money. So, IMO, I would really buy those “rack packs” instead of buying the boxes, that has been my experience thus far with UD…..I plan on buying one of those “tins” to try my luck…… I still want the regular Matthewes YG, (I have the big one) I have the Nylander already – I have all the leafs YG’s really…..I’m pretty close to the set…… I’m just wondering which base cards are SP’s because they seem to be eluding me….. I’m missing maybe 20 from the set, as a Hawks fan I know I’m missing Toews, Crawford, Keith and the Forsling YG (I have 5 of Schmaltz, and I’m happy with that he’s going to be a good player) “young Spezza”…. Enough rambling, hope I could help anyone getting back into the hobby…. Don’t buy the boxes that have the “big cards” given my experience, tho I did pull a “big” Matthewes in my first box, but bought another box and got nothing… Stick to the packs…. I’ll try a tin tomorrow and will certainly update if I pull something phenomenal. Also, let me point out – and this has something to do with collecting that many of us collectors in our 30’s er 40’s will find amusing…. It’s interesting that you can pull the same active player from a card pack when you’re 10 and 37 … I pulled a Jagr and was like…. mmmm. haha.. That makes it worth it all day… Used to pull his RC’s as a kid, now I’m pulling him as Gordie Howe 79-80…. Found the collecting of hockey cards now, really hits in the pocketbook. Upper deck has really become pretty stale looking, if it were not for the Young Guns, would be pretty much bottom end card wise. The inserts are not much to write home about, as you can buy them for peanuts, jerseys for example have become so many you can get them pretty cheap. The photography is pretty lame, for the most part, not really a fan of it as I loved action shots much better. Upper deck has the NHL card market locked up, so they can come up with a plain looking set and collectors like us have to take it or leave it! Easily the best Young Guns year in a LONG time! I’d highly recommend getting this product! With rookies like Matthews, Nylander, Morrissey, Laine Canvas, etc, it’s a great product!